166 pages | 30 B/W Illus. Since 1995 most mainland migrants to Hong Kong have been the wives or non-adult children of Hong Kong men of lower socio-economic status. The majority of immigrants are women, who throughout the past two decades have accounted for more than 60% of immigration. The profile of immigrants has been changing and they are significantly more educated than was the case in the past. Despite the improvement in the educational level of mainland Chinese migrants since 1991, and their increased involvement in paid employment, migrants have continued to experience great difficulty integrating into Hong Kong society and anti-immigrant sentiment seems to have increased over the same period. This raises the question of how gender and socio-economic factors intersect with migration to influence the extent of migrants’ adaption to Hong Kong society and culture. The growing anti-China sentiment in Hong Kong also raises the question of how the integration of migrants into a destination society is influenced by the political context. 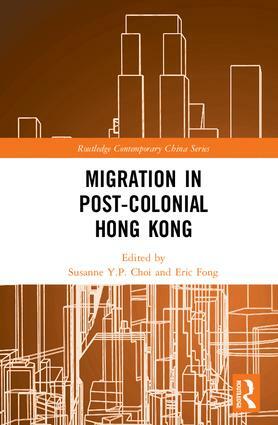 Examining the questions around migration into Hong Kong from a range of multidisciplinary perspectives, this book combines quantitative and qualitative data to portray a detailed image of contemporary Hong Kong.